Results have been submitted by Sit, Stay & Play in Stroudsburg, PA for the September competition of the summer series. They took over the top of the first page! NatGeoTV plans to publish a program featuring Top Dog and the National Dog Agility League. This is not a series. But we are inclined to want to blow their socks off and make it very clear that it should be a series. The plan is for February of 2017 in conjunction with the events surrounding Westminster. The format that I have envisioned all along is a competition between the two top franchises in the NDAL league. That means that accrued scores for each club in 2016 will qualify the teams for the on-air competition. At the same the play will be open to anyone in the world who wants to put up the course, utilizing basic social networking tools for the recording and aggregation of scores. Obviously we’d like to see the league expand. The workbook for October, the final game of the series, can downloaded HERE. If you have interested in jumping into League Play, you barely have time to play on the second course of the summer league. The workbook can be downloaded here: September League. Results have been submitted by K9 Powersports in Grand Junction, Colorado, and Dachshund Hill Agility in New Glarus, Wisconsin for the September competition of the summer series. If you have interested in jumping into League Play, you still have time to play on the second course of the summer league. The workbook can be downloaded here: September League. 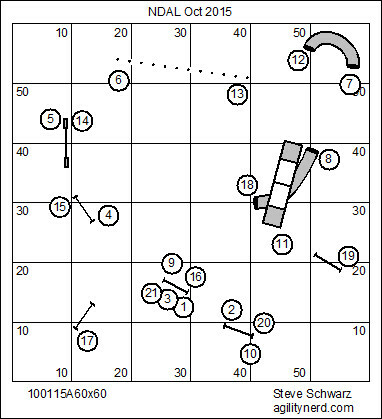 The final course of the summer series is a numbered course designed by Game Master Steve Schwarz. Each of league clubs will get the scorekeeping workbook for October with their current rosters upon submitting the September league results. For anyone who’d like to establish a new league franchise download the scorekeeping workbook HERE. As league participation increases some clubs might be interested in weekly competitions that coincide with regularly scheduled classes. 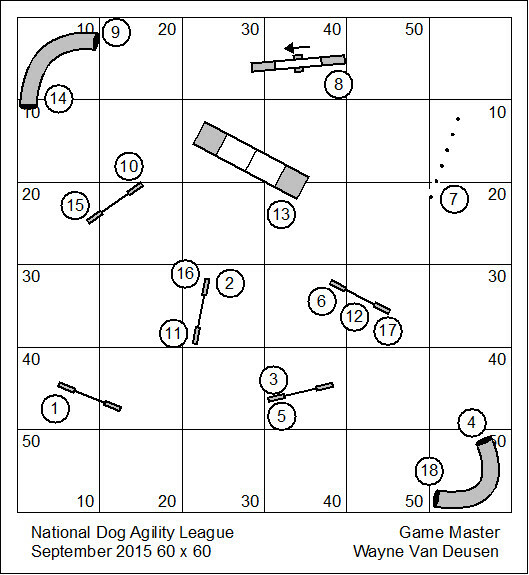 With this in mind, the Catalog of Games has been updated with all National Dog Agility League games and courses that have published results. The courses are organized by the size of the field; so it should be relatively easy to find a challenging game or course that fits in your working space. Download the Catalog of Games HERE. If dog agility is to remain a game we play with our dogs and our friends, we first want to shift the focus away from the infrequent and costly qualifying attempt to a light-hearted and weekly romp in the park. As well as being just plain fun, it league play also serves to strengthen relationships with our dogs. As we lighten up and get more chances to play the game, our mood lifts, our nerves settle, and our dogs have a much better time. Running a league sounds very involved and time-consuming. But the benefits far outweigh your efforts. A wonderful sense of community is built around league teams. And every league course presents an abundance of training objectives. If you have interested in jumping into League Play, you still have time to play on the first course of the summer league. The workbook can be downloaded here: September League. Results have been submitted by Clermont County All Breed All Stars (near Cincinnati, Ohio) in the September competition of the summer series of the National Dog Agility League. Results from the All Stars are included with previously reported results. Brenda Gilday writes, with the reporting: We did our league play at Clermont County last Thursday, 9/17. We try to do league play on every third Thursday of the month. It went very well and we even voted on a team name. We will now be known as the Clermont County All Breed All Stars. We are even going to get team shirts to wear on league play night. We had 18 dogs compete in the league last Thursday, 2 new handlers from the week before. The league is a “hit” at Clermont. If you have interested in jumping into League Play, you still have time to play on the second course of the summer series. The workbook can be downloaded here: September League. Country Dream Agility in Waterford, OH is the first league club to report results for The National Dog Agility League September challenge. New clubs are welcomed to join us in league play. 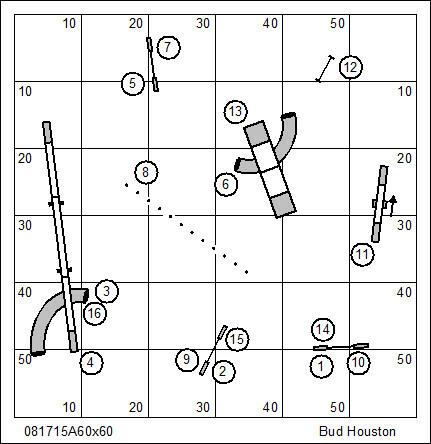 Download the September Workbook (contains scorekeeping, course map, and briefing). A single performance point is earned for playing/participating in an NDAL game. Every NDAL course or game is a historical artifact. That means that it can be played at any time. And any new results that you post to that game will be aggregated with previous scores. A dog also earns LPP for each score (new or existing) to which his score is superior. A club might fast-track its players to higher earned LPP by choosing games or courses that have already reported a number of performances. There have been no changes of substance in the August League game of the NDAL summer series. However, Clermont County Dog Training Club has sent along YouTube links for their players. Results have been submitted by K9 Manners & More (Broken Arrow OK) and Country Dream Agility (Waterford, OH). All National Dog Agility League courses are open for play at any time, even by dogs that have previously competed. 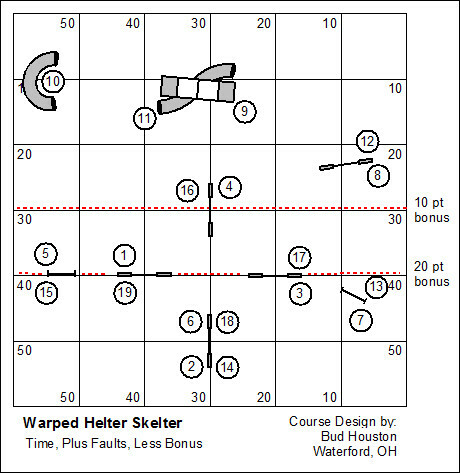 A dog’s placement will earn Lifetime Performance Points for all bested scores; and will increase the Lifetime Performance Points for all dogs with superior scores. Results have been submitted by: In Contact Dog Training (Springfield, IL); Dachshund Hill Agility (New Glarus, WI); and Sit, Stay ‘n Play (Stroudsburg, PA) in the August competition of the summer series. In Contact Dog Training is a small club, managing to compete admirably with bigger franchise clubs. In Contact Dog Training does a great job including YouTube recordings with their results. It’s fun to watch what how handlers and dogs in other parts of the world managed this trickier-than-it-looks Helter Skelter. Both Dachshund Hill and Sit, Stay ‘n Play are new to the National Dog Agility League. We’d like to extend a special welcome to these franchise clubs! We’re thrilled to have you in the league. These new results are included with previously reported results. These are the final results. Reporting is closed.